Join us in the AngryMarks.com/chat at 10 PM Eastern, 9 Central on Tuesday nights for Ring the Bell! Tonight's show features Killa Kev, Ciara, Xtreme Tony & Mike Poulin discuss the latest rumors and news from WWE, TNA, ROH & more! As always Seth Drakin gives us the weekly TNA Spoilers to the Rescue. 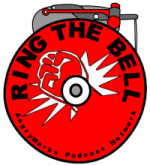 Enjoy another edition of Ring the Bell from your friends at The AngryMarks Podcast Network!